Tameside is a place of contrasts and endless interest for a photographer, but it would be fair to say, and I think even the borough’s most vehement supporters would have to agree, that not all of it is magnificently beautiful. One of the best things about living here, however, is the access the area enjoys to places that are beautiful or special in other ways. In one direction is the magnificent and world-changing city of Manchester; in the other are the Pennines. 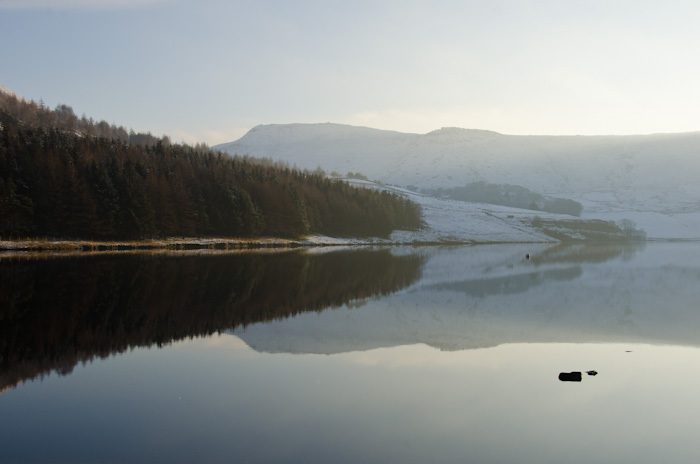 This is a photograph taken at Dovestone Reservoir in Saddleworth, nestling in the edges of the Pennines, just a ten or fifteen minute drive from my home turf in the Tameside town of Stalybridge. I have just loaded several images taken on the same day into the Architectural Photography (which includes landscape) section of this site, and I invite viewers to take a look. The Pennines present some magnificent scenery for the casual visitor and the serious walker. Catching Saddleworth in the snow like this was a real treat for the eyes.